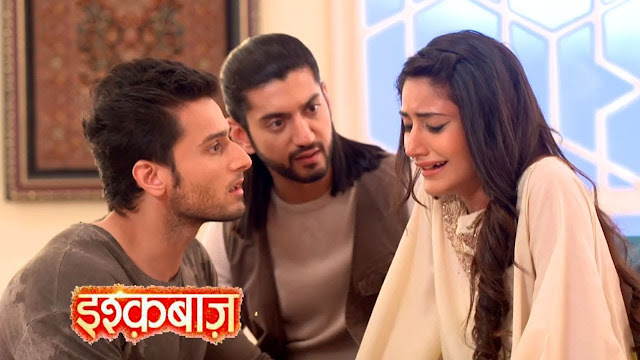 Star Plus love drama Ishqbaaz will witness romantic sequence in the middle of Anika-Shivaay in the upcoming track. Anika invites Shivaay on romantic candle light dinner so then Shivaay gets ready for going in dinner with her. Shivaay reaches to meet Anika and gets mesmerized seeing her as she is looking absolutely stunning in blue saree. Anika falls in Shivaay’s arms & they both share romantic eye lock. They both sit for having dinner but again their nok-jhok begins and Shivaay gets annoyed. Anika begins to eat food & Shivaay smiles seeing her childish behavior. Just then Rudra comes there and gets happy seeing them together; he clicks their pics secretly and uploads them on social site.